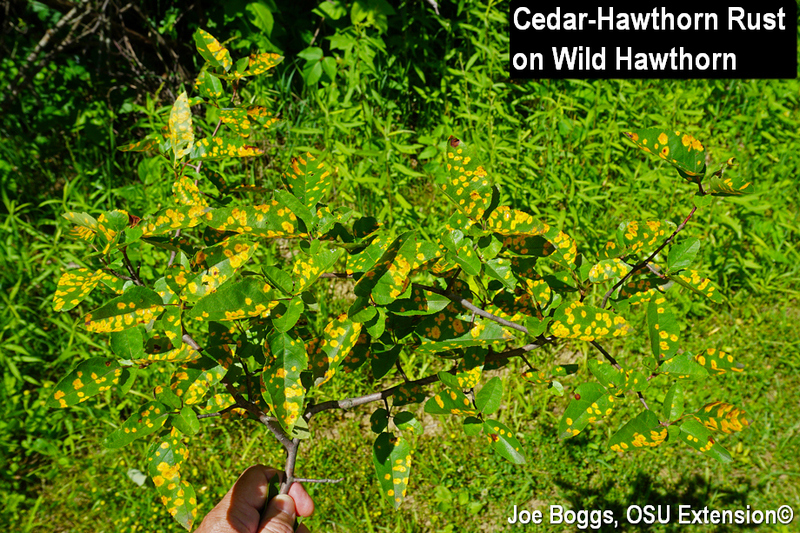 This is the time of the year when rust diseases make it easy to spot wild hawthorns growing along Ohio trails as well as cultivated hawthorns in landscapes. They have orange spotted leaves and "orange-hairy haws." I may be exaggerating a bit, but these rust symptoms can certainly make woodland hikes interesting. Gaudy orange spots painted on the leaves are the artwork of the Cedar-Hawthorn Rust fungus, Gymnosporangium globosum. The "orange hairs" sprouting from the fruit (haws) show that the Cedar-Quince Rust fungus, G. clavipes, is the stylist. These are two of the "big three" types of rust fungi that may be found on trees and shrubs in Ohio woodlands, landscapes, and sometimes in nurseries. The other is G. juniperi-virginianae that produces Cedar-Apple Rust. The “cedar” part of these disease names refers to eastern red cedar (Juniperus virginiana), which of course is a type of juniper; these fungi do not infect cedar. Each of these rust fungi must alternate between a member of the plant genus Juniperus and members of the rose family (Rosaceae) in order to complete their entire life cycles. The requirement to rotate between two types of widely divergent host plants coupled with the rusty color of their spores earns these fungi the collective moniker of "heteroecious rusts." The cedar-hawthorn rust fungus produces small, irregularly shaped galls on junipers measuring around 1/4 - 1/2" in diameter. The galls may arise from the needles as well as the stems and appear wrapped in jelly when they ooze spores in the spring. Infections on hawthorn may occur on the stems and fruit; however, the most obvious infections appear as brightly colored yellowish-orange spots that contrast sharply with the dark green background color of the leaves. The spots are evident on both the upper and lower leaf surfaces. Eventually, tiny black dots called spermagonia appear in the spots on the upper leaf surface and short tube-like structures called aecia extend from the spots on the lower leaf surface. Spores from the aecia, called aeciospores, drift on the wind to infect Juniperus hosts in late summer and autumn to start the alternating-host life cycle over again. Although the hawthorn leaf infections may be very evident, and the galls on junipers sometimes noticeable, this fungus rarely causes significant harm to either of its alternating plant hosts. Cedar-quince rust is a different matter although one if's obvious and perhaps best known symptoms causes no plant health damage. Infected fruits sprout bizarre looking bright orange tube-like spore structures (aecia). The fruit infections cause no harm to the overall health of affected trees. However, "orange-hairy fruits" reduce the aesthetic appeal of heavily infected trees, or they add ornamental value depending on your perspective. Also, the bright orange spores (aeciospores) that rupture forth from the aecia will settle onto sidewalks, patios, outdoor furniture, slow-moving gardeners, etc., to bestow a noticeable burnt-orange patina. Of course, in the proper hands, the spores can have great entertainment value. More significant damage is produced if the cedar-quince rust fungus infects hawthorn stems and thorns. Stem infections can produce significant twig dieback causing serious harm to heavily infested trees. The dieback may become widespread throughout the canopy with the overall tree symptoms mimicking bacterial fire blight. Infections on juniper can also produce both noticeable and potentially damaging symptoms. The fungus infects several species in the Juniperus genus including selections sold in the nursery trade and used in landscapes. On junipers, the fungus produces twig cankers from which spores are released that infect plants in the rose family (Rosaceae) such as hawthorn and quince (thus the disease name). The stem cankers can disrupt vascular flow causing stem dieback. While I've never seen this disease cause junipers to die, the ratty appearance of heavily cankered junipers may cause people to wish heavily infected junipers would die! On the other hand, these rust fungi can cause hikers on Ohio woodland trails to pause and take a second look at hawthorns and eastern red cedars. In assessing the impacts of these rust fungi, perhaps we should focus on their artwork rather than the canvas.